This pattern is available at Knitty.com for free and can be found here. 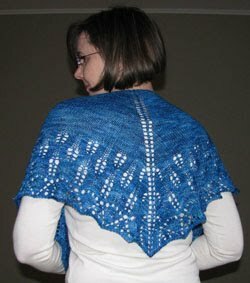 I’d picked up one skein of Malabrigo Lace (470 yards, 100% merino and oh-so-soft!) on sale at Tradewinds in Dartmouth, NS. It was the last day that her store was open so what was left was heavily marked down. The pattern says that one skein will suit it, but I only had enough to get to the outer edge of the 5th section of rushing, still, though, it is a wearable size.